Since finding out the baby was a boy I have been getting some ideas in my head for his nursery. It all came together pretty simply and I had no idea where it would take me. 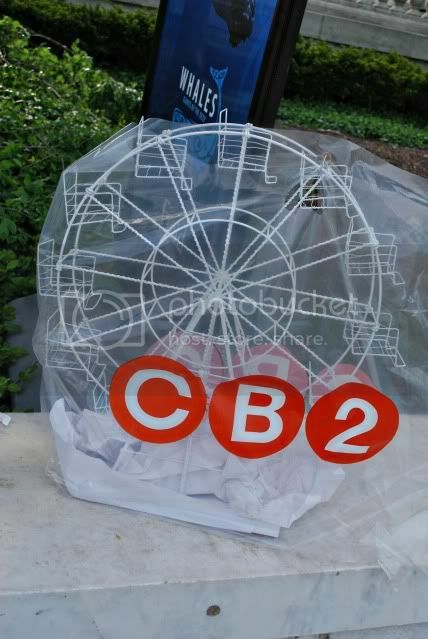 I guess the main inspiration for the room is my beloved CB2 Ferris Wheel that I picked up in Chicago this past summer. I had always wanted to put it in the guestroom but it really serves as the perfect inspiration for our baby's room. I don't know about you, but something about ferris wheels makes me smile and think of carefree fun in the summertime. I immediately was drawn to incorporating a bit of whimsy into this little guy's room and Dave likes to tell everyone that the theme is "whimsical." I am so not a theme person but he caught me off guard one day when he asked me how I was going to decorate. Of course the words, "the theme is whimsical" left my mouth and I haven't been able to live that down since. Most people are taken aback when I tell them I really have no direction--no surprise there. My rooms are always quite the eclectic mix. Throughout these past few weeks we have been so blessed by family and friends who have gifted us major portions of the little dude's room. So far my sweet brother and sister-in- law have bought us the crib, my father-in-law is building special custom shelving for the closet, and my mom, step-dad, and grandparents are pitching in tofor the glider. David and I are eternally grateful that our baby boy is already loved so much. Besides all of the big ticket items, baby boy has already received numerous items from my dear friends, too. It makes me an emotional sap to think of how much I adore my family and friends and how blessed we are in this life. 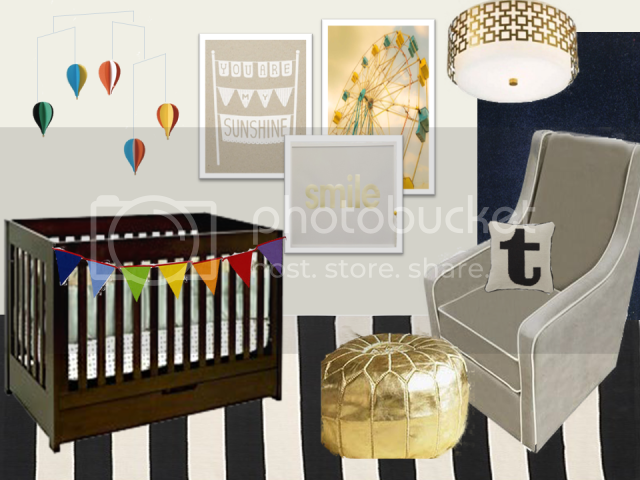 So without further ado, here's my mood board for our baby boy's nursery! Since it was my first dabble in mood boards I'm sure I could learn a thing or two, but overall I'm pretty pleased. This is the direction I'm headed in and can't wait for it all to come to life. Over Christmas break we plan to make some headway so be expecting some IRL photos soon. Thanks for letting me share his room with all of you. Love it. I couldn't WAIT to see what you'd dream up! Looks fantastic!! Love the rug and the colour scheme. What a great source of inspiration! The mood board is sophisticated, with a touch of fun. Great for a new baby boy! I'm also obsessed with that CB2 ferris wheel and have contemplated getting it for our nursery - and I love your design for the nursery, it's going to be gorgeous! I love what you have come up with -it is going to look fantastic! I love it! We find out in one week if we are having a boy or a girl, and this is totally my "boy style". I will definitely be using this as inspiration (and I've already had that glider bookmarked, lol). Please tell us where that "you are my sunshine" print is from? Where did you order the glider from? I am on the hunt and haven't found the perfect one yet but that looks close to what I want. Super cute - where did you find the "You are my sunshine" print at? I love it all, Joi! I knew I would. I'm especially digging the pennants and the hot air balloon mobile. Too cute! I'm Aldo a huge fan of the glider. Did I miss where it's from? What a colorful and happy nursery Joi! Love it! Love it Joi! Can't wait to see it all come together! I love the navy and the accents are adorable. Can't wait to see more in the room! I am about 2 months behind in my blog reading. Went back to work full-time, then the holidays began, so I'm catching up during vacation this week. (Need to figure out how to balance working and DIYing and blogging in the new year.) Aaaanyway, just learned of your pregnancy and wanted to say a big CONGRATS! What fun to have a reason to redecorate a room! Love the ferris wheel. I had seen that at CB2 and thought it was cool. I.LOVE.THIS. Loooove the subtle whimsy (nothing wrong w/ whimsy!) & crisp color scheme. Makes me want to do a room in navy! Can't wait to see the room come together--your sweet baby boy is going to love it. It's going to be fabulous! Can't wait to see what you put together. Hope you guys had a great Holiday season. The ferris wheel is so sweet. Yup, it reminds me of summers and carnivals and funnel cakes. The nursery mock-up is so adorable and I LOVE the gray glider and rug. Joi, I love it all. I know this is an old post, but bloggers been acting up for me. I have that cb rug and I love it. I can't wait to see it all done.